A new book for the collector of Confederate Treasury notes which will revolutionize the perception of the military and civil endorsements on the backs of Confederate T-39, T-40, and T-41 interest-bearing $100 notes. This book identifies the military Quartermasters and Commissaries of Subsistence who used these interest-bearing notes to purchase supplies for the Confederate war effort. The book also identifies many of the civil agents who disbursed these notes for the Confederate Treasury Department. Data were gathered as a group effort by the members of the Trainmen, and this new information is now available to all collectors. Rich historical data and anecdotes are provided for many of the endorsers of these notes. Full images of the front and back of each note are provided, allowing the collector to quickly identify these signatures. The appendix is rich in detail, including essays on the classification of these endorsements. 6 x 9 inch format, 288 pages, most in full color. 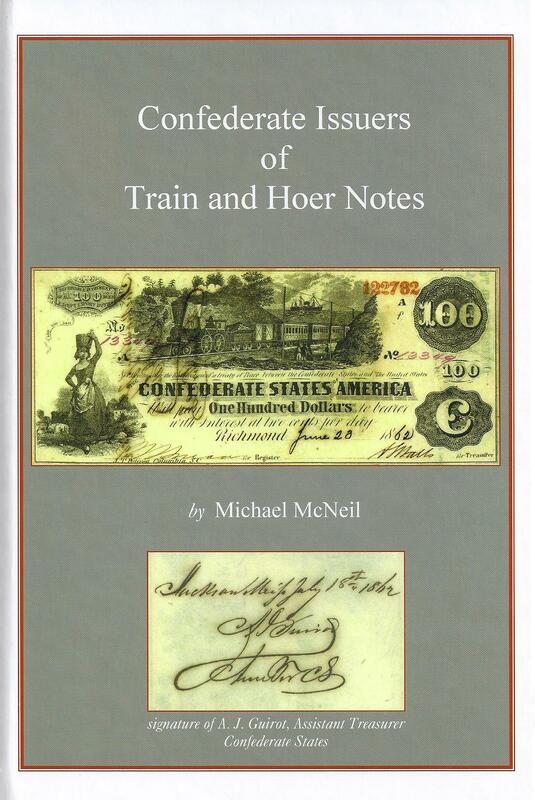 Confederate Money 7.3% Train and Hoer Notes, $49.